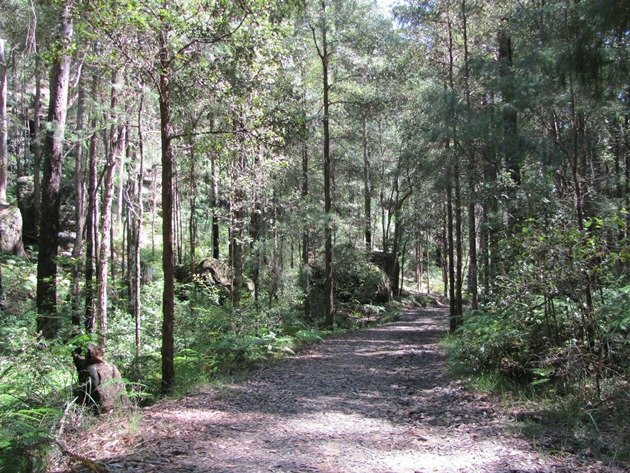 On our trip to New South Wales in June we took the opportunity to return to one of the picturesque bush walks that is not too far from the city and easily reached by public transport. We had walked this trail in March 2012 and it was most enjoyable, so we found time the day before we left Sydney to hop on a train to Hornsby to once again walk the Blue Gum Walk. We had originally found out about this walk from the excellent website called WILDWALKS and it has been an excellent resource for finding walk trails in the Sydney area and beyond that you can access by public transport. The website gives you plenty of information, so you set off in the knowledge of how long it will take (they do allow for birding! ), the terrain, how to get there and a few photographs. There are numerous walks on the website that are loops or train station to train station and also information on the Great North Walk, which takes you from Sydney to Newcastle over 30 short walks or a two week hike. The train station at Hornsby is the start of the walk and there are shops nearby if you need supplies before you head off or on your return. It is clearly signposted to the west of the station by following all signs to the Great North Walk. You follow the road down the hill and then take the track to your left. There has been the development of an official Mountain Bike Trail since our visit in 2012 and this follows off to the right. It appears to be a popular area and keeps the bikers and walkers apart nicely. You arrive at an open park before you enter into the tallest of the Blue Gums and is it worth stopping and taking a look around the trees. 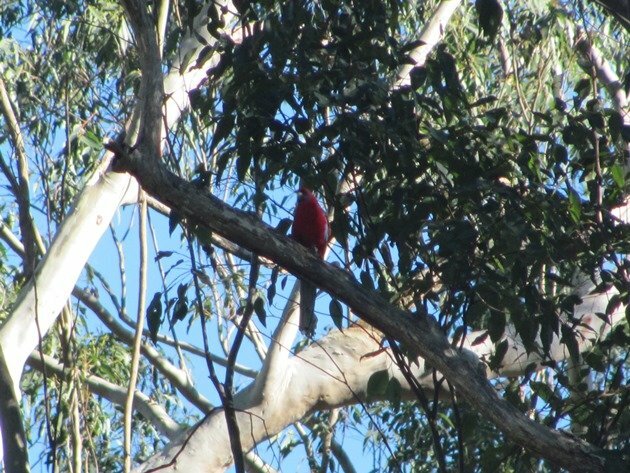 There were several Laughing Kookaburras in the trees and looking very high up there were Crimson Rosellas. 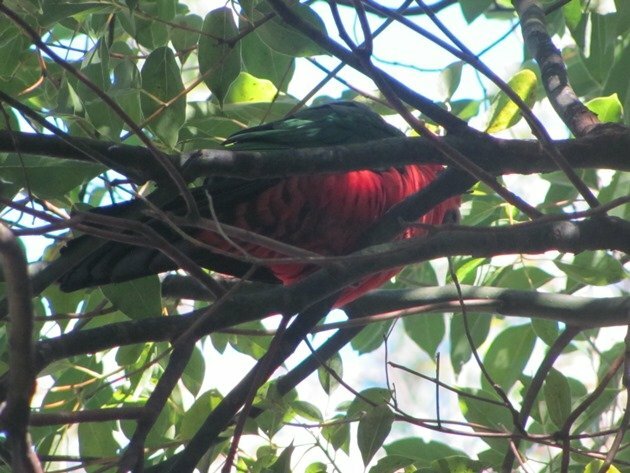 It is always amazing that such a brightly coloured bird can hide so well in the trees! Even the Eastern Rosellas are able to hide despite their bright plumage. 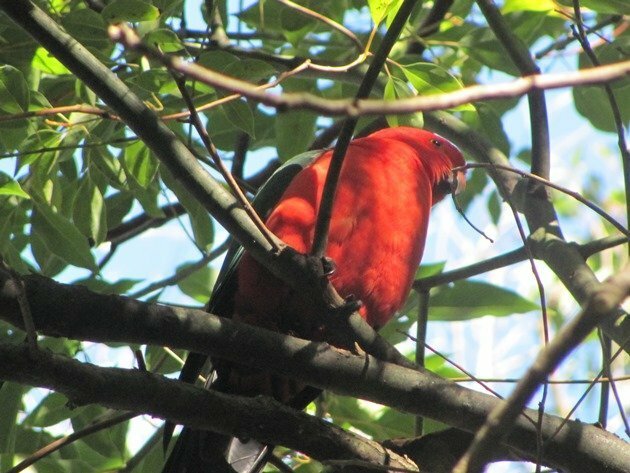 We could hear King Parrots in the forest and once again an incredibly brightly coloured bird was able to hide. 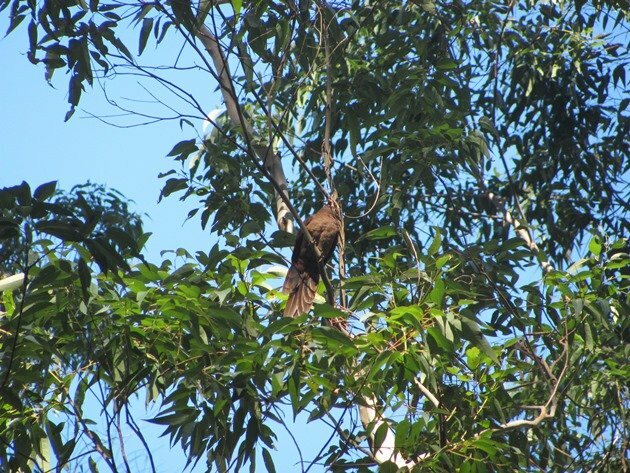 Even the male Satin Bowerbirds with their completely black plumage was able to hide in the depth of the forest. Of course there were small birds that would flit through the canopy high up and there was no opportunity to photograph them at all! Spotted Pardalotes, Silvereyes, Eastern Spinebills and Brown Thornbills nipped through the bush giving us moments to identify them. 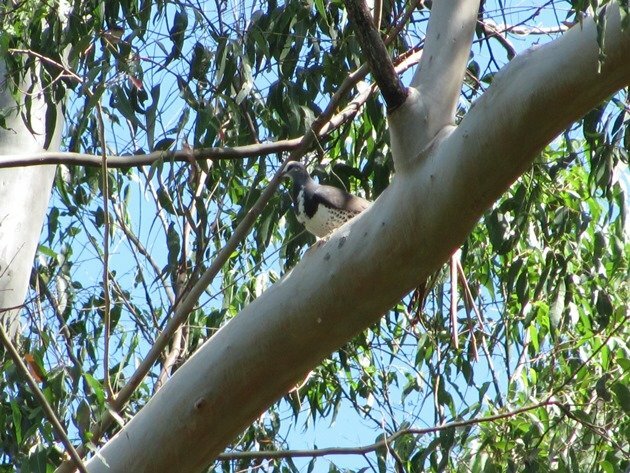 The height of the trees does make it hard to observe some species as they fly over, such as the Yellow-tailed Black Cockatoo, but there is no mistake to their call as they cross through the gaps in the canopy. White-throated Treecreepers were often seen on the tall trunks of the gum trees as they fed on the insects and the most numerous honeyeaters were the White-faced Honeyeater and Yellow-faced Honeyeater. 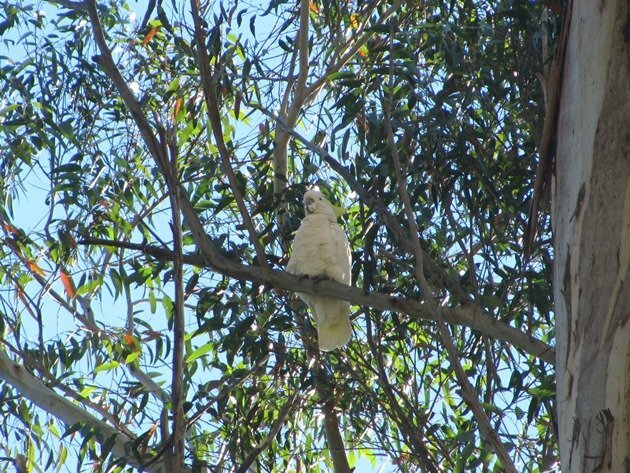 We did a short detour out along the fire trail before we got to the creek and this offered more spectacular views through the trees and the sound of breaking twigs brought our attention to the Sulphur-crested Cockatoos. A Golden Whistler flew across in front of us and grabbed a large insect, but had no intention in thinking about the view we would have as it devoured the grub. 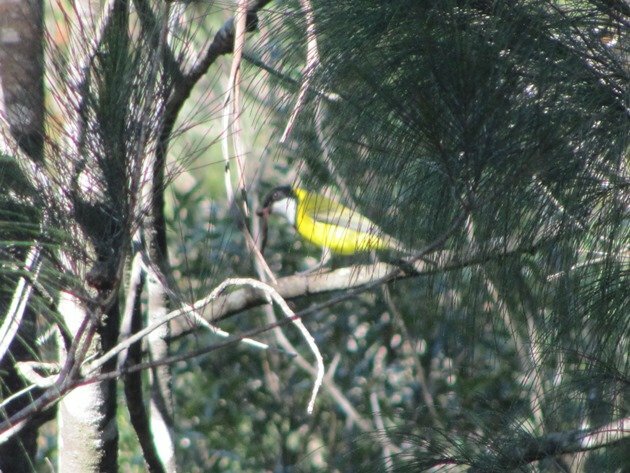 So, my photograph shows the brightness of the Golden Whistler, the grub in its beak and a whole load of natural bush! Maybe it is possible to remove some of that bush from your photograph, but I have not ventured down that path! I won’t even share my attempt at a photograph of a Rock Warbler in the rocky outcrop, because it was too quick and I was too slow! This is the closest to Sydney that we have seen Rock Warblers and definitely worth a look if you are hoping to see the species. You just need to approach all rocky outcrops with the expectation that there may be a Rock Warbler and realise that you can’t see it and photograph it! Towards the end of the walk we encountered first one and then more Brown Cuckoo-Doves. On our visit in 2012 we encountered one bird of this species, but on this occasion 2 months later in the year, we had over two dozen Brown Cuckoo-Doves. 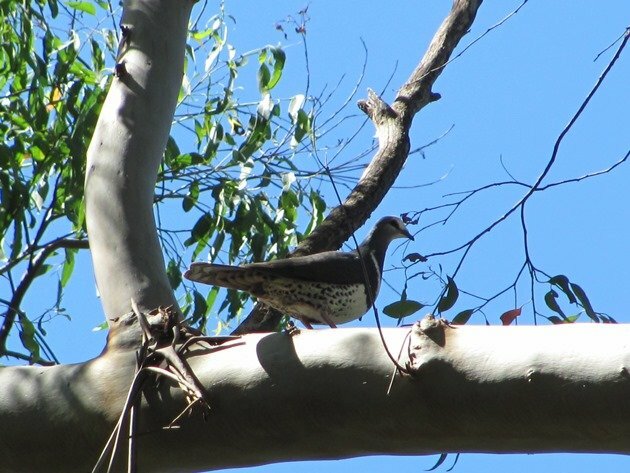 As with the naming of most Australian birds it is literally “brown” and looks like a cross between a large “cuckoo” and a large “dove”! The forest in this one area was an excellent roost site for Brown Cuckoo-Doves on this day in June. Shortly after, a large bird flew up off the track and there was no doubting it was a pigeon. It had been waddling along the track and flew noisily up into the trees as we approached. There are some beautiful pigeons in Australia and the Wonga Pigeon is no exception. Although it is a grey pigeon it has a large V shape on its breast and black spots on its flanks. 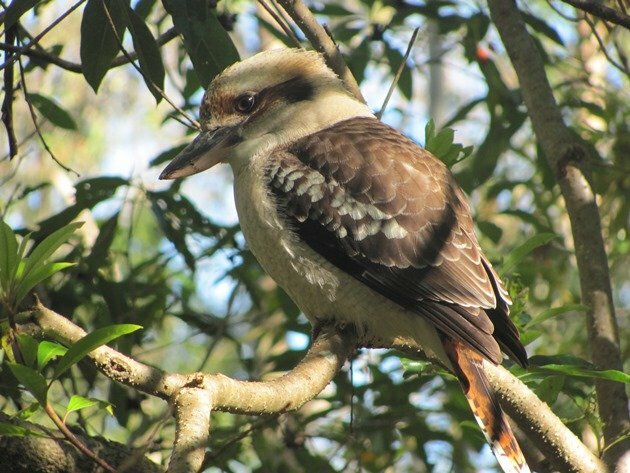 The Blue Gum Walk is an excellent walk taking in a variety of habitats and you can expect to observe at least 40 species of birds during the walk. Some will be easy and others will be challenging, but isn’t that part of the fun of birding? !